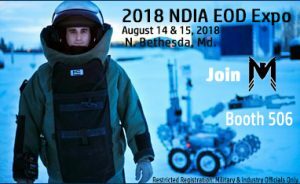 Join Mohawk at 2018 NDIA Global EOD Expo - Mohawk Electrical Systems, Inc.
N. BETHESDA, Md. – Mohawk will be exhibiting again at the NDIA’s annual Global EOD Expo in N. Bethesda, Md. on August 14 and 15, 2018. This years event will be held at the Bethesda North Marriott Hotel and Convention Center and the event will run from 9 a.m. to 3 p.m. on both days, with a networking reception on August 14, 2018 beginning at 5 p.m. This year, the event will be focusing on “Modernizing New Threats,” according to the event page provided by NDIA. In addition to 60 exhibiting companies, a symposium featuring panelist and industry officials focusing on three sub-track methods of encountering explosive devices will be featured. This year, Mohawk will be featuring both their live and inert EED lines including the M6 blasting cap, Mk20, and M18A1 and M68: Claymore Weapon/Practice Systems. This events registration is restricted to Military and Industry officials. For more information on admissions and other featuring exhibitors, please click here. If you have projects you would like to discuss with Mohawk but will not be attending the event, Mohawk will accept off-site meeting requests. To request a meeting, please email: info@mohawk-usa.com.